Gerrymandering has voters incensed. How fed-up constituents are fighting back. A grass-roots movement grows to rip political map-making out of the hands of politicians. In November 2016, Katie Fahey posted on Facebook that she wanted to "take on gerrymandering in Michigan." Tired of the divisiveness in politics and frustrated with state district maps that she felt were preserving incumbents and not accountable enough to voters, Fahey, an independent, said she knew people were hungry for change after a presidential contest dominated by outsiders. "If you want to help, let me know," she wrote, adding a smiley face. Thousands did. Nearly two years later, Fahey is the founder and executive director of a more than 5,000-person volunteer organization, Voters Not Politicians, that spent months gathering signatures to get a redistricting initiative on the ballot in November that would appoint an independent citizen commission to draw Michigan's voting maps. This week, they won a major court battle after the state Supreme Court shot down a challenge to the initiative. "People recognize that elections just aren’t working," said Fahey, 29. "They don’t feel like politicians are responsive or accountable to them as a voter." She said much of the campaign has been about trying to educate voters — redistricting policy is hardly a day-to-day concern for most people — and trying to tie it to more everyday issues like infrastructure and schools. To bring the issue to life, volunteers have dressed up in costumes, built wacky-looking districts out of Legos, and written songs and jingles about gerrymandering. Every 10 years, state legislative and congressional maps need to be redrawn to account for changes in population growth after the decennial census. Most states allow the state legislatures to draw the maps, and legislators in both parties have gerrymandered to boost their futures and elect more of their party (by drawing districts with partisan aims in mind, either by spreading out the opposing party's voters among districts that have more of their own party's voters, or by packing as many of the opposing party's voters in as few districts as possible). But increasingly sophisticated districting technology and voter data has made gerrymandering more efficient, leading parties to unusually strong holds over certain districts and even state legislatures. "The problem has gotten much more extreme this decade than it ever has before, and it’s only going to get worse in the next decade," said Wendy Weiser, director of the Democracy Program at New York University School of Law's Brennan Center for Justice, a nonpartisan think tank. Decades ago, "people were not more pure of heart, but they didn’t have the tools to achieve the partisan ends as effectively." In hopes of barring lawmakers from choosing their own voters, some states have instead decided to let nonpartisan or bipartisan groups of voters draw the districts, achieving varying degrees of autonomy from the legislature. Currently, 13 states including California and Arizona have a commission whose job it is to draw the districts; five other states have advisory commissions, and another five states have backup commissions in case the legislature cannot agree on new maps, according to the National Council on State Legislatures. They've been buoyed by advocates like Arnold Schwarzenegger, who has vowed to put his political muscles into the fight to end gerrymandering, and former Attorney General Eric Holder, who is leading redistricting efforts on behalf of Democrats. "We’re at a turning point of the public really stepping up," Weiser said. In Utah, a group called Better Boundaries mobilized 5,000 volunteers to gather 190,000 signatures from across the state — approximately 77,000 more than they needed — to get a proposition on the ballot that would create a seven-member commission to draw maps that adhered to a set of standards, later sending them on to the legislature for approval or rejection. If Proposition 4 is passed, the governor would appoint one commission member, while the majority and minority party would equally split the six other seats on the commission. “We really think if we can do this in Utah, it's a message to the whole nation that you can do it everywhere else," said Better Boundaries co-chair Jeff Wright. More than 1,500 volunteers working with CLEAN Missouri, a coalition of advocates and individuals, gathered 346,000 signatures in support of a ballot initiative to enact six ethics proposals, including having a nonpartisan expert draw legislative maps that would then be reviewed by a citizen commission. The initiative was certified on Thursday, according to the organization. Supporters are planning to campaign on foot and on the airwaves in support of its approval in November. In Colorado, after anti-gerrymandering ballot-measure efforts gained steam, the Republican-controlled state Senate and Democratic-controlled state House both voted to put two constitutional amendments on the ballot in November that would turn the redistricting process for the state legislature and congressional seats to independent redistricting commissions. While the courts have thrown out voting maps that disadvantage minorities, they've so far declined to weigh in on whether gerrymandering itself is illegal. The U.S. Supreme Court recently rejected two claims that states violate the Constitution when they become blatantly partisan in their district maps. There are 24 states with ballot initiatives to allow citizens to bring changes like these. A May ballot initiative in Ohio to require bipartisanship in the redistricting — or establish an independent redistricting commission to do the job — was overwhelmingly approved by voters. A South Dakota initiative failed to gather enough signatures, however. 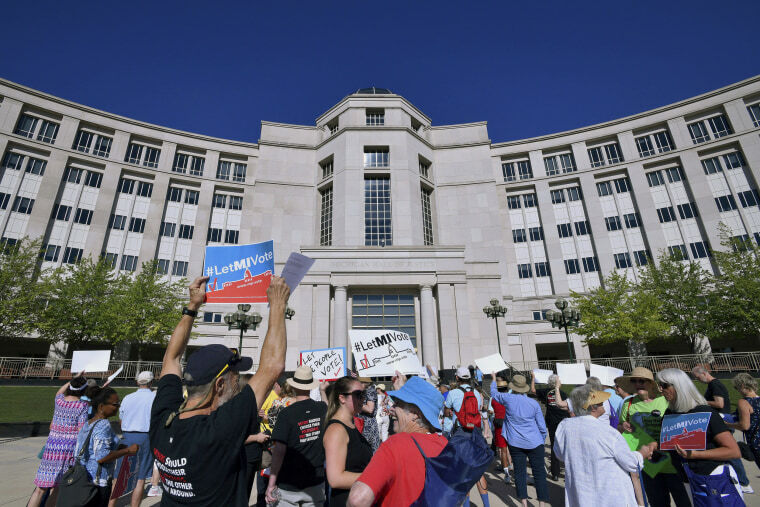 Those in other states who want to change their redistricting processes would need to seek out legislative or judicial solutions, though Weiser noted it is difficult to convince legislators to cede this power. "Ballot initiatives are not going to solve the whole problem," she said. "But they’re going to make a huge difference in the states they're in."